This feature creates an environment of highly managed Projects	in Decisions. The Designer Repository allows us to manage changes that are made to the projects more efficiently, commit changes to them, revert changes, or rollback the project to the desirable state. This environment is secured by user credentials	when they want to make changes to the Project,	meaning there is full control over how and who access is provided to. Moreover, this feature uses Decisions Permissions semantics to allow only desirable users to participate in the Project. 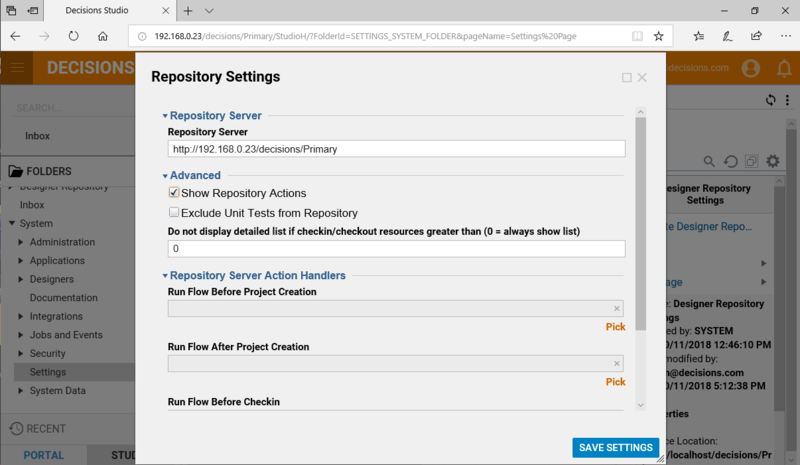 The Repository is a fantastic feature when using multiple environments or looking for a shared work storage and management space. 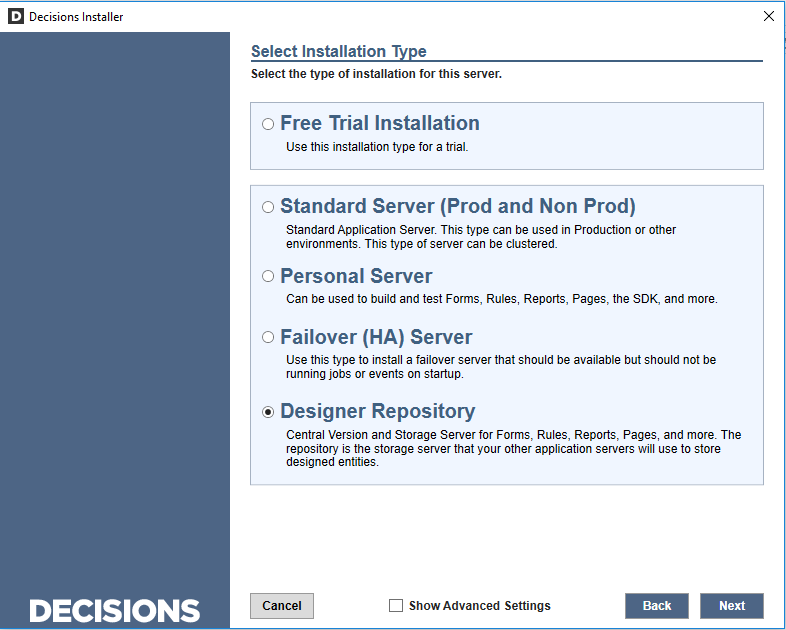 This document walks through how to install a Decisions Repository Server. First, Run	the DecisionsInstaller As Administrator. The Decisions Installer	then prompts the Licence Agreement,	read and agree to before selecting Next. 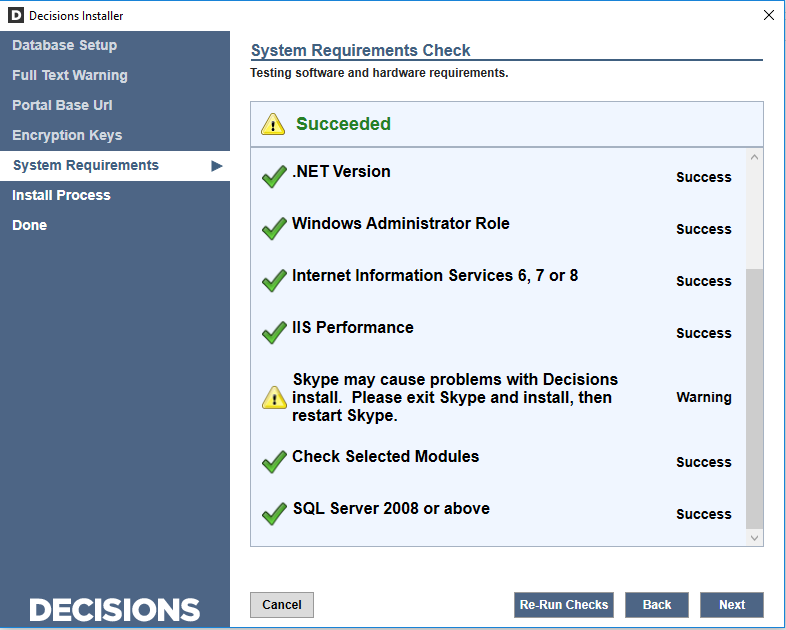 The next dialog in the wizard shows a list of the different Decisions Services that can be installed. Select Designer Repository	and chose Next. The Database Setup	dialog will display and here a working Database connection is established. 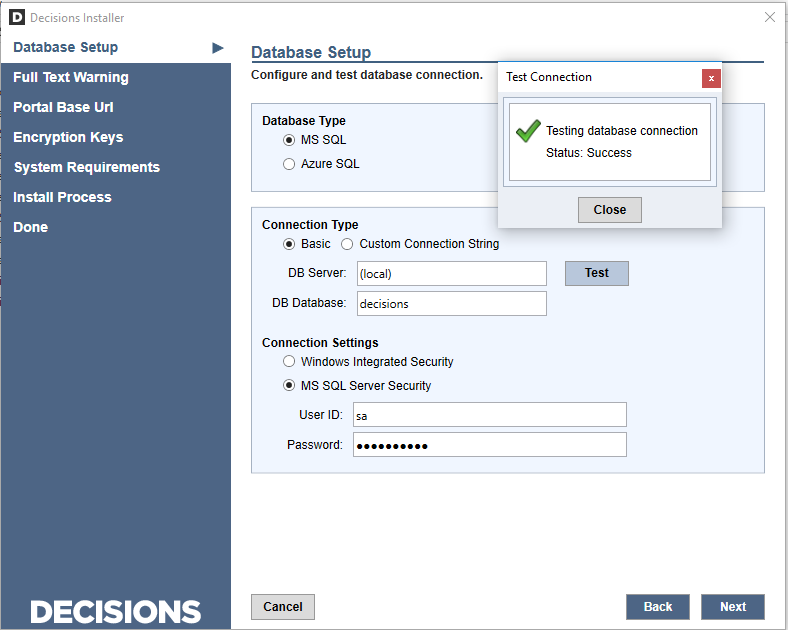 Under Database Setup then Database Type, select the MS SQL	option. Under the Connection Type, select Basic	or Custom Connection String	and fill in the DB Server	and DB Database	fields with the server location and name of the database. If the database does not exist, Decisions OS will attempt to create it. To test these connection settings, select the Test	button. Once the connection is tested select Next	to proceed. The next dialog is an SQL Warning Message which can be skipped, select Next . Then the Encryption Keys	section is displayed, which can be disregarded unless you are installing to a previously existing Decisions Service/Server. This can be ignored unless there is data that should be used or restored. Select Next. Next the Installer checks system requirements and for anything else that might cause conflict during the installation. Once everything passes select Next. Note : Skype may cause issues with the installation of Decisions, it is recommended to disable the service and potentially uninstall for the time being if causing issues. Find the list of System Requirements	here. Now the Installer starts its process and begins the installation. At this point wait for the loading bar to fill and for the installation to complete. When the installation completes, an Installation Finished screen displays Decisions Application installed successfully. 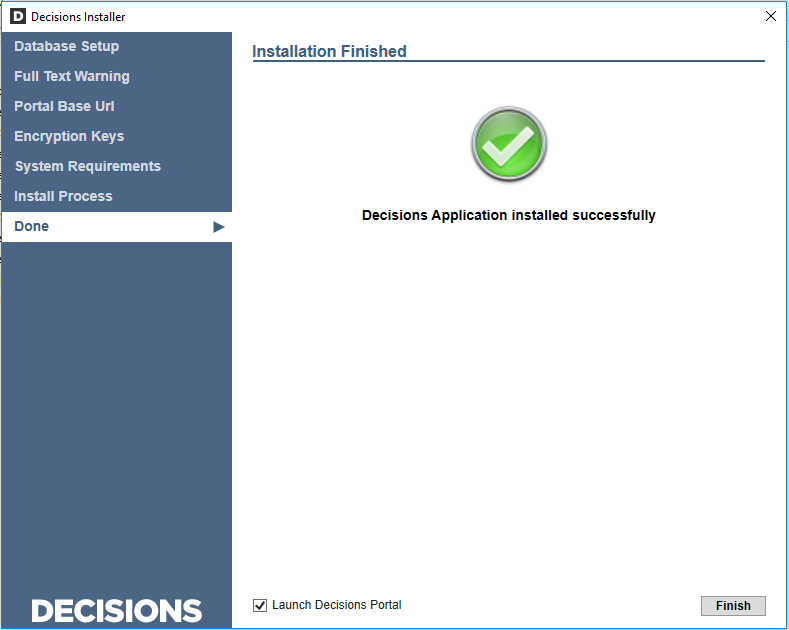 If not already selected, select the Launch Decisions Portal checkbox and the portal will open upon exiting the installer. 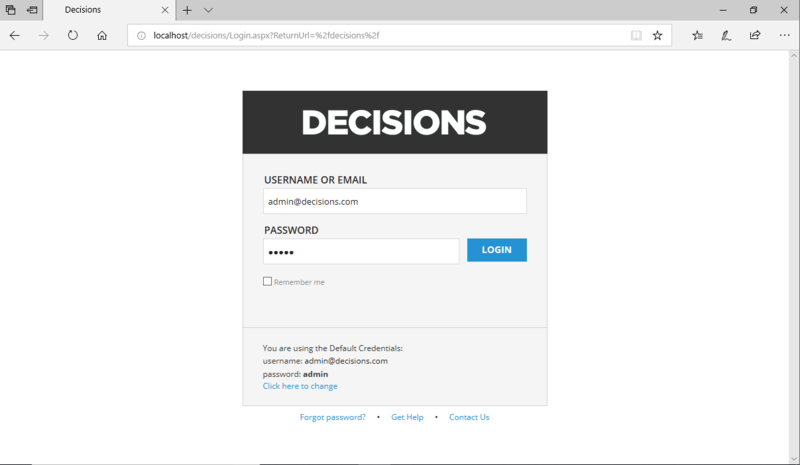 Upon exiting the installer the Decisions Portal login page automatically opens. Use the Administrator credentials to log in here. Note : It is highly recommended to change this password immediately upon the first successful login. Once the log in info is entered selected Log In. In order to get the Decisions Server to utilize the repository, the Servers must be able to communicate via IP or DNS. Therefore the Decisions server must be configured to reference the Repository Server. 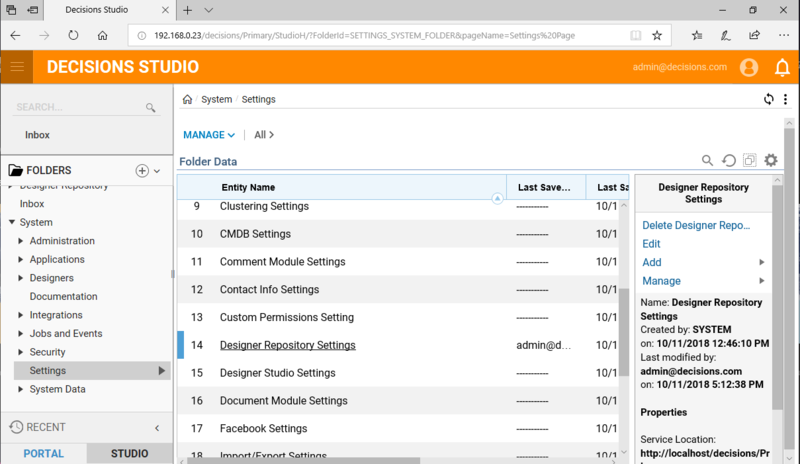 The Studio folder structure is located on the left hand side, from here navigate to the System > Settings,	within the Settings	folder select Designer Repository Settings to finalize the Setup & Access for this Server configure Repository Settings. In DOS, use ipconfig command to check the IP Address. Look for the IPv4 Address, and confirm that it matches with the Local Address. The next setting is under Advanced, check the Show Repository Actions	checkbox in order to allow Repository Actions to be taken. Save	Settings.